If you have been waiting for Microsoft to tell all about Windows 8, today is your lucky day. After offering a brief look at the user interface at our D9 event in June and dribbling out some details over the past few weeks, Redmond is finally ready to tell all — well, probably not all. But at least a lot more. 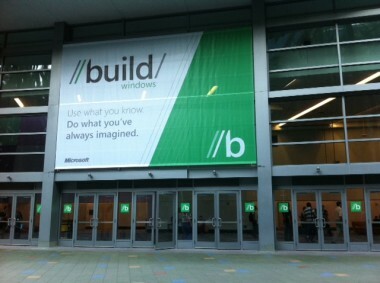 The venue is the company’s Build developer conference in Anaheim, Calif. We’ll have live coverage here starting soon. 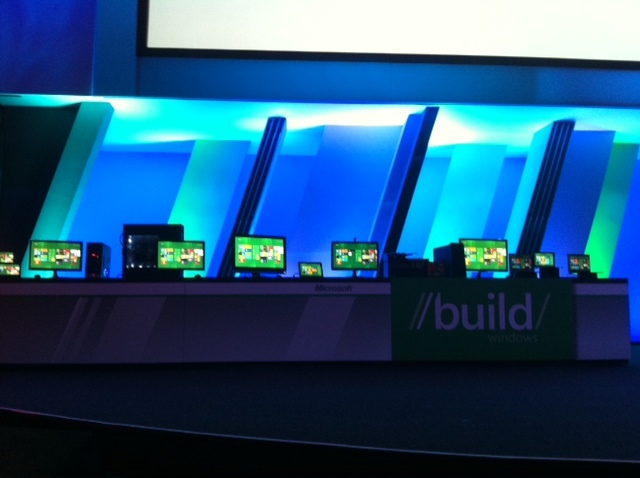 Meantime, here’s what we’re learning today about Windows 8 as well as a look at what Microsoft is asking of developers. 9:15 am: OK. Up and running now (it appears). 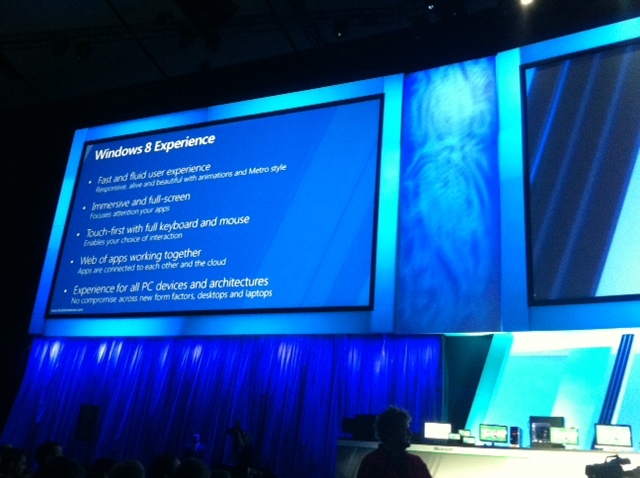 Windows 8 is getting its on-stage demo, with Julie Larson-Green showing the user interface. Steven Sinofsky started things off showing Windows 8 running on the same first-generation Lenovo netbook that he used to show Windows 7. The computer has a relatively low-power Atom chip and 1GB of memory. Takeaway: Windows 8 doesn’t require anything more hardware-wise than Windows 7. 9:17 am: Larson-Green is showing a cool feature of Windows 8, what Microsoft calls semantic zoom. It is similar to the pinch-to-zoom gesture we are familiar with, except that what is displayed on screen adjusts visually to reflect the amount of space available. 9:19 am: Although this is a developer event and the final version of Windows 8 is some time off, Sinofsky said today marks a launch, of sorts. “What we are launching today is a new opportunity for developers,” he said. 9:22 am: Windows 8’s new look features immersive full-screen apps, but also has an ability to run two of those Windows apps at once. Users can fill the screen with an app or give the program two-thirds or one-third of the screen and let another app use the remainder (those are the only options). 9:24 am: Larson-Green showing off the immersive Internet Explorer 10 in Windows 8. It can run full screen with no address bar or any other user interface “chrome” until you want one. “I don’t think anything is better than an entirely chrome-free browsing experience,” Sinfosky said, getting in a jab at Google. 9:27 am: A couple new concepts to get used to with Windows 8. One is “charms,” which are activated by swiping out from the right side of the screen. Charms are settings common to all Windows 8 apps and include the ability to access settings, search options and a share button. The search and share features allow other Windows apps to offer themselves up as potential search and sharing options. Applications agree to a “contract” with Windows, which allows multiple Windows apps to interact without having to know the other exists. 9:30 am: Contracts can also be used in other ways, such as an app or online service offering itself up as a source of pictures, something Larson-Green showed on stage. 9:32 am: Larson-Green wraps up the user interface presentation by noting that her whole demo had been done on an ARM-based tablet. That said, it showed only new Windows at work, not classic desktop applications. That appears to be a key limitation for Windows on ARM. While Windows 8 on Intel and AMD can run new and classic Windows apps, ARM-based systems seem likely to be limited to mostly running new Metro-style apps. 9:43 am: Sinofsky and Windows Senior VP Antoine LeBlond are now explaining how developers can write the new Metro-style Windows apps. Without getting too geeky here, traditional Windows uses one set of programming interfaces, while the new apps rely on a new set of hooks. That said, Microsoft plans to let developers write the new apps in a variety of programming languages including those familiar to Windows developers as well as others more commonly used by Web programmers. 9:47 am: LeBlond is doing a coding demo. I’m going to assume that all of the folks that enjoy such displays are in this room. He’s creating a program that lets you doodle on photos. I’ll let you know when he’s done. 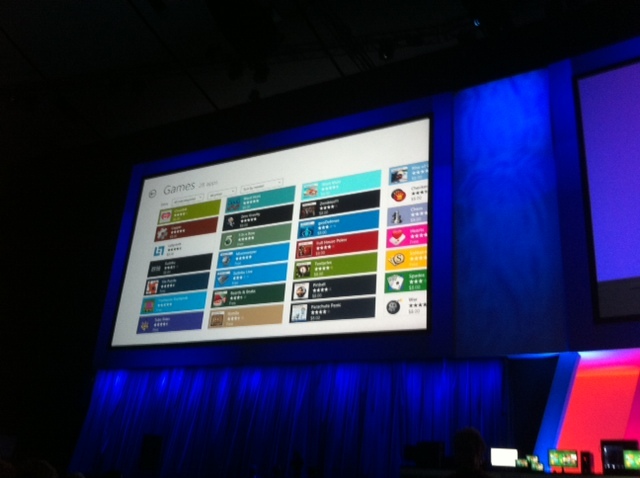 Of note, later in the demo he is going to upload it to the Windows Store. That’s another thing that is new with Windows 8. 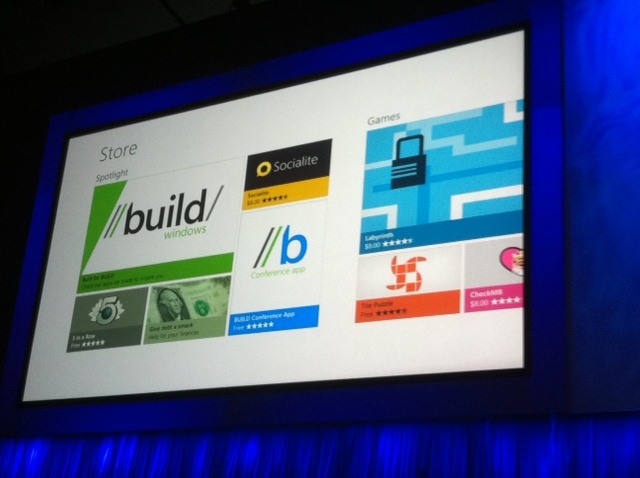 New-style apps for consumers will be distributable only through the Windows store. Classic Windows apps, by contrast, will continue to be sold as they have been, though developers can put a landing page showing off the programs inside the Windows store. Microsoft isn’t offering a lot of details on the Windows Store, nor is it active in the developer preview being handed out today. That said, other documents point to some sort of revenue-sharing agreement and Microsoft said it will support paid and free apps, as well as ad-supported programs and in-app purchases. He’s now submitting the app to the store, showing the process of submitting an app, selecting a price, deciding whether to offer a free trial period, etc. Trial can be as little as a day or as long as 30 days. 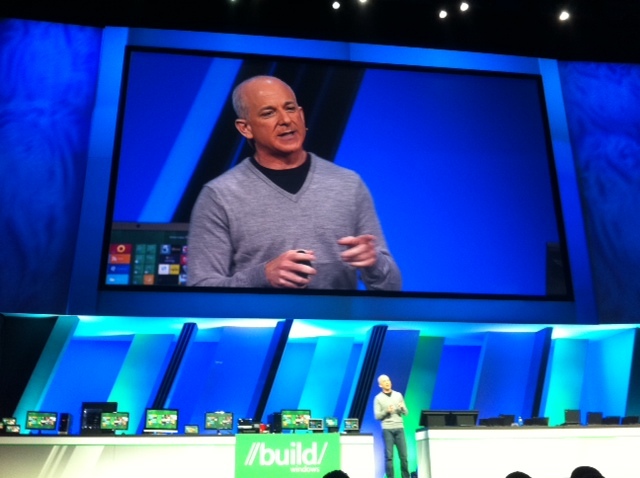 10:01 am: If you want to read Sinofsky’s take on the developer preview, he’s got a new blog post. 10:02 am: A couple important tidbits from that blog post. Developers who want to download the preview version of Windows 8 being handed out at Build will be able to do so starting at 8 pm PT tonight (with or without the accompanying developer tools). A usual collection of caveats. It’s early, lots of bugs, not meant for your main machine. Also, this early code only allows for a clean install, not an upgrade from Windows 7. 10:04 am: Meanwhile, back on stage, LeBlond and Sinofsky show how Silverlight can be used to write apps for both Windows 8 and Windows Phone, albeit with some targeting and customization work for each device. Users can still use third-party antivirus software, Microsoft is stressing, saying Defender will gracefully take a back seat when other software is installed. 10:20 am: Windows 8 also supports a variety of sensors like accelerometers and gyroscopes for the kinds of tilt-controlled applications you see in tablets and smartphones. With support for near field communications (NFC) sensors, Windows 8 PCs can talk to objects or one another. 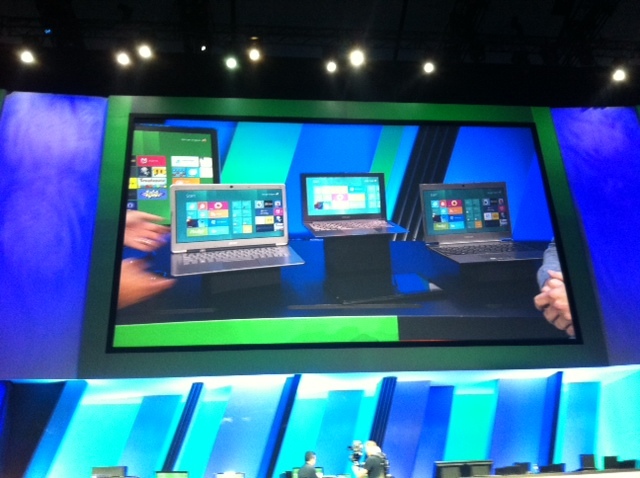 10:26 am: Showing Windows 8 running on a bunch of recently announced (but not yet shipping) Ultrabooks (super-thin laptops). How thin? One model is thinner than the Ethernet or the VGA ports. Meanwhile, they are getting to the handout and the crowd is getting quiet. Angiulo is describing the Samsung tablet that attendees are getting. Wireless connectivity built in from AT&T. Lots of sensors. Paid attendees will all get one. It’s the same machine seen in the video we posted earlier today. 10:30 am: If you want to know what you are missing, the tablet has 4GB of memory, 64GB SSD, a bunch of sensors, 11.6-inch screen and support for pen input. Dock with HDMI and Ethernet. Weighs 909 grams and is 12.9mm thin. 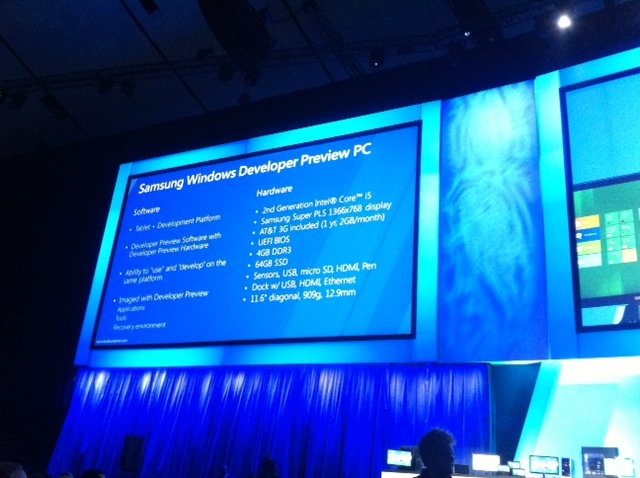 “It’s a machine for developers,” Sinfosky said, noting it comes with developer preview and tools to write Windows 8 apps. 10:32 am: Windows 8 also features new recovery options that let a user “refresh” to an earlier good state while maintaining their data and settings. 10:32 am: Sinofsky trying to show that Windows 8 still powerful, despite its flashy new look. Shows it working with traditional keyboard and mouse. He opens new task manager, which runs in the desktop and allows users to see what is running. Meanwhile, he notes that when a user is in that traditional desktop, all of the Metro-style apps get suspended because they are not running. “That’s one of the ways we are going to get extended battery life,” Sinofsky said. 10:46 am: Haven’t lost connection; we’re just in the weeds. Among latest details; Windows Explorer has an up button, built-in desktop virtualization, desktop backgrounds can span across multiple monitors. 10:47 am: Keyboard fans, fret not. There are shortcuts for everything. Back to some cool stuff. You can synchronize your settings across multiple PCs and access other Windows PCs. 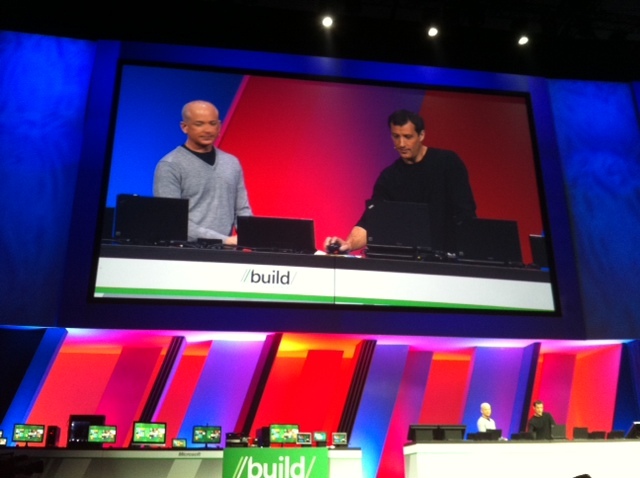 10:57 am: Sinofsky intros Chris Jones to show some of what Microsoft has done with Windows Live for Windows 8. 10:57 am: Jones shows Metro-style mail app connecting to Exchange and Hotmail. 11:00 am: There’s also a calendar and a connected contacts app that brings together multiple accounts (kind of like webOS’s Synergy, it appears). 11:00 am: Photos app can bring together photos stored locally as well as those on SkyDrive, Facebook, Flickr and other places. Photos can even be grabbed from a remote PC that is also logged into Windows Live. Then photos from any or all of those places can be shared via email. 11:09 am: Yes, that’s right folks, we’re into overtime. Still blogging away and have an hour and a half of battery left on MacBook Air, but things appear to be wrapping up somewhat. Jones is still showing photos synching on both Windows 8 and Windows Phone. One demo fail. 11:11 am: Developers can also write apps that use SkyDrive for storage. 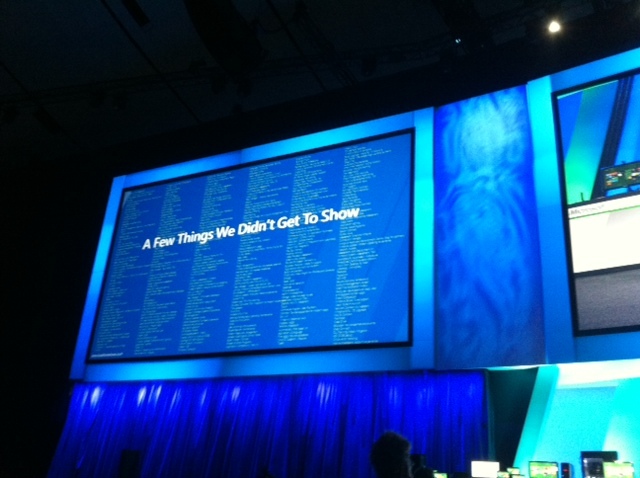 Sinofsky shows huge slide of features there wasn’t time to show. Also, the developer preview Windows 8 ships with a bunch of sample apps built by 17 teams of 2-3 interns given 10 weeks to write their apps. Some of them are here and stand up and take a bow. Cue video of them making their apps. 11:16 am: Sinofsky wrapping up. Talking about the schedule. First is today’s developer preview. That will be followed by a broader beta version, a near-final release candidate and then the final build. Sinofsky was predictably vague on timing. “We’re going to be driven by quality and not by the date,” he said. 11:18 am: Code will be available at 8 pm PT from dev.windows.com with or without developer tools. Plus side: You won’t have to activate it like a commercial release. Downside: No support, either. 11:19 am: Keynote wraps up. More coverage today and the rest of the week from Anaheim.